I love working at my West Village office for one solid reason- lunch! There are so many great food options in this area and I got to visit one of my favorites on Friday the Spotted Pig. The Spotted Pig is well known for its great gastro pub feel, amazing food and two to three hour waits for dinner. Luckily lunchtime is much calmer and quite frankly the best time to visit in my opinion. I got there right around 12:30 and got seated at a table upstairs overlooking the beautiful trees outside. I was going to try out one of their new menu items but old habits die hard. I had to get the burger. Have you ever seen a prettier looking burger in your life? It's like a work of art! Spotted Pig makes its enormous burger from three cuts of meat- brisket, rump and chuck. These cuts combined make this burger so moist meat juice literally runs out only to get sopped up by the fluffy brioche bun. Mmmmmmm...meat juice. Then they top it off with a generous helping of creamy Roquefort cheese. Now Roquefort cheese is very strong and stinky. If your not a big blue cheese fan ask for it sans the cheese. I always take a little bit off but I enjoy a taste here and there and think it really adds a wonderful element to the burger. The shoestring fries are amazing as well. Incredibly tasty on their own, they amp up the flavor a notch by adding fresh rosemary and fried garlic to the mix. Oh how I love me some shoestring fries! 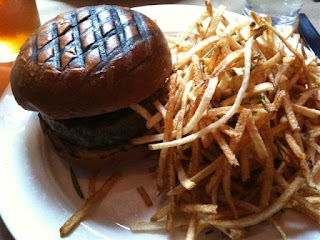 The Spotted Pig is one of my favorite burgers in the city and it truly should not be missed. Celebrities apparently are always seen here but I've never noticed anyone. Why look around when you can stare at this gorgeous burger instead? I've seen Tom Coclicchio there before but I have never eaten there either. It sounds like a great place to try out for lunch! Thanks for the tip.